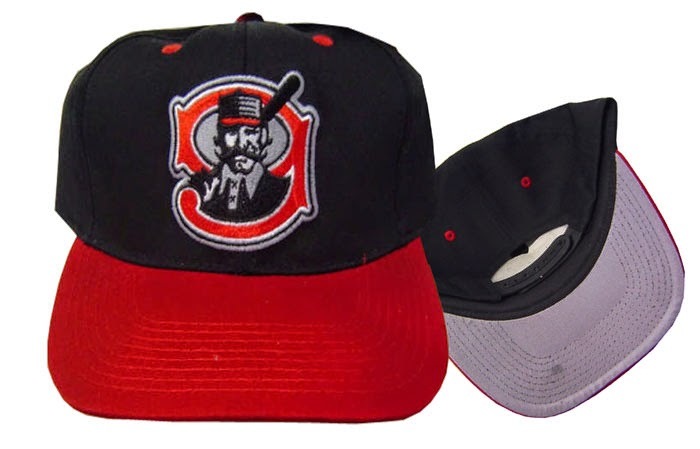 It seems like lately I haven't been able to come up with an answer to this very simple question: what is it that makes a minor league ballcap interesting? An item of note is that the Stockton Ports have long-believed that the Ernest Thayer poem "Casey at the Bat" was based on their team. While that might or might not be true, I like that they believe it enough to use an image of a Mudville Nine batter-man, who himself is wearing a pillbox cap with an M on it. I love meta-caps! 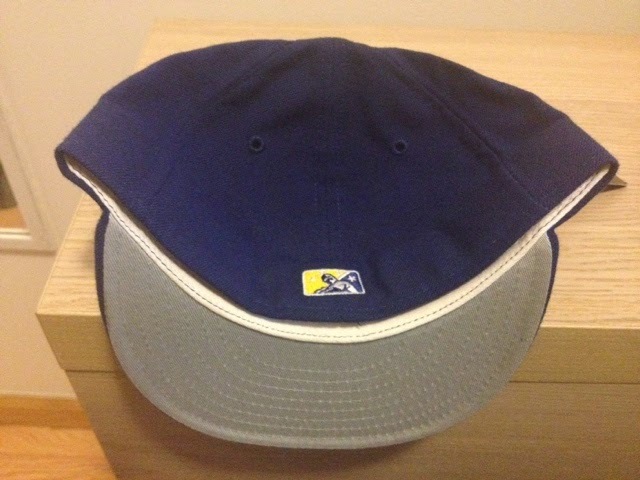 As for the production year on this cap, there is no evidence of it before the 1994 season. It's not often-seen as the team favored different variations of this cap in the years following its debut. 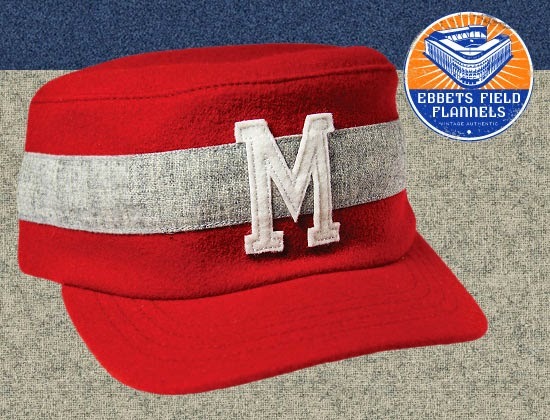 This cap is similar to the Midland Angels cap that was featured last week in more ways than one. Firstly, the caps are alike because the inner tags are identical but also because each does a great job of balancing allegiances that I've mentioned before. 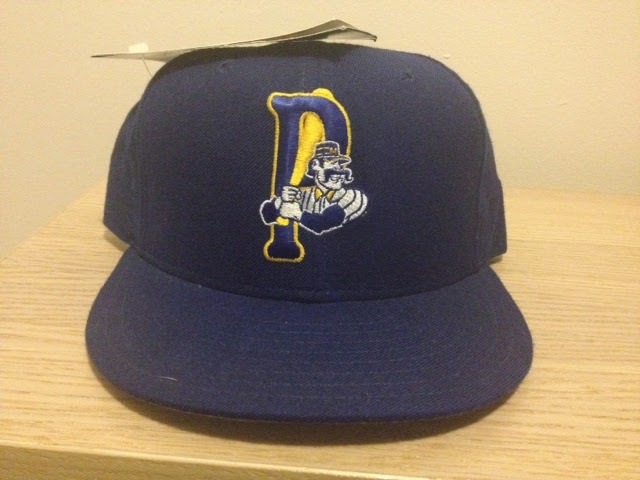 I like that the cap honors the alleged ties to the poem yet the colorway of the cap follows that of the Milwaukee Brewers, which was their parent team at the time. Actually, back in the 1990's when I knew nothing about the Mudville Nine, I just assumed that the "M" stood for Milwaukee! Update: After further research, I've determined that the MILB version of the rear batterman logo did not appear until 1995 so that is the earliest year this cap could be from. My earliest memory of the Ports cap was that the logo had always been comprised of the word "Ports" written in all capital letters with this garishly yellow, nondescript block font. I never gave much thought about the uniqueness of that cap because it wasn't a one that many future MLB superstars had worn. The one before it though is kind of fun. I appreciate this card because you can see that while the team had not yet adopted the "Mudville Nine" batter as part of their cap logo, they at least had him featured on some memorabilia at the time. The funny thing about this card is that it seems to be the only one that comes up when I perform a search for "Sheffield" and the "Stockton Ports" so I'm wondering if there are any others out there that I just haven't seen yet.